SPIE is an international society advancing an interdisciplinary approach to the science and application of light. Optics and photonics technologies enable researchers, scientists and engineers to help improve life. SPIE Digital Library contains the world’s largest collection of optics and photonics research with over 430,000 papers from SPIE Journals and Conference Proceedings from 1962 to the present. The Digital Library provides unprecedented access to research on state of the art and cutting-edge technology advancements. 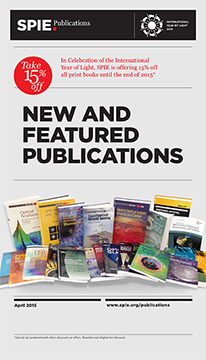 SPIE publishes those peer-reviewed papers that are most influential in field optics and photonics that will significantly advance scientific understanding. As a result, publications of SPIE are essential enabling resources for institutions and corporations engaged in research, development, engineering and technology for furthering research initiatives and making wise business decisions. Discipline areas of coverage: astronomy, biomedical optics, defense and security, energy, illumination and displays, medical imaging, nanophotonics, sensors.